Most research focuses on the impact on both workload and performance of specific cognitive tasks and their associated cognitive demands. This relationship is shown in the figure below. Stated most simply, what this figure suggests is that two things happen when a task becomes too hard for an individual: first, of course, his performance suffers because he can’t do it. Second, and less obvious, is that as the task becomes more difficult, it most likely encompasses a wider set of cognitive demands, and these expanded cognitive demands drive up the individual’s cognitive workload. So, the performance graph goes down while the workload graph goes up. 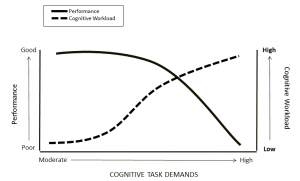 Human cognitive workload and cognitive task load are inextricably linked. We are rarely interested in cognitive workload for its own sake in the absence of any context. Rather, we are interested in cognitive workload because we want to understand and possibly improve human performance on a specific task or job. If we accept that the cognitive demands of a task greatly impact human cognitive workload and hence human performance, we can take the next step of trying to impact performance by changing either the cognitive task demands or the cognitive workload produced by them. I’d like to read up some more on the temporal relationship between task demands and performance. In the graph, the intersection/interaction occurs post increase in task demands and it looks like though performance decreases marginally before this, it is sustained for just a bit despite the steeper task demands slope. Is there a good place to find more on this?